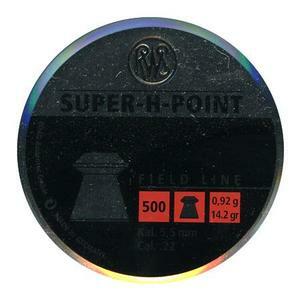 Super H Point Hollow Point Pellets. A diablo pellet with a hollow point, characterised by high deformation capability and strong penetration. It's an excellent pellet just a little tight in the Hatsan AT44 magazine. Works much better in the springer. Not as good the Crosman hollow points. Never thought they would be this good . Put them through my gladiator fac and they are so accurate, and a good price. I quite like RWS pellets, typically the Superdomes and Superfields, so thought I'd give this hollow points a try. I was pleasantly surprised at how accurate they are. Excellent out to 20m, fairly good at 30m. They are not in the same accuracy league as the domed pellets but as far as hollow points go these are excellent.